Love the way the little leather vest reigns in the volume of the dress/top. Also, the fish necklace is quirky and cool! Cool shoot. The proportions on her are very interesting. This picture is a masterpiece! Love the model, her clothes, the colors of the buildings and the sky, the wet street, the ambience… everything. Balenciaga is a modern classic. I’ve just discovered your blog, and I really like it!! she looks incredible! and I am in love with that gorgeous balenciaga! 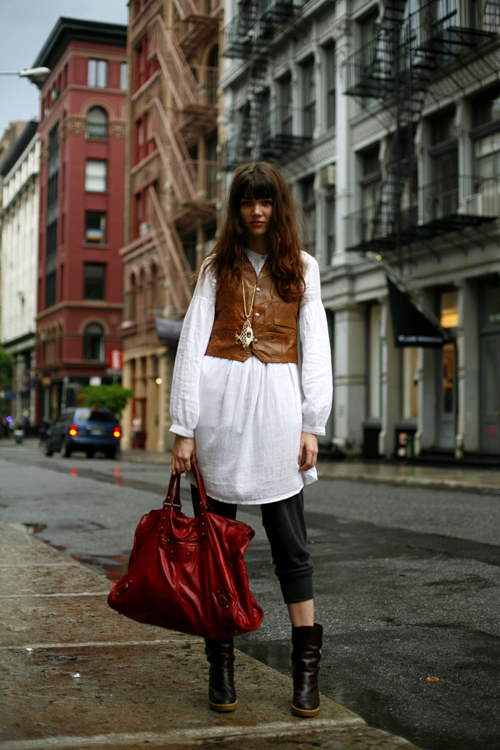 i would die for a haircut like that..
Great outfit, serene and folksy. Very balance – the bag makes it. hmm. not thrilled about this one. it seems a little bit too johnny depp in the pirates of the caribbean for me. very nice. she knows how to mix and match texture AND color and the application is almost like sculpture, certainly art. nice nice nice. nice photo…this looks like a shot I’d see in a fashion magazine! Great! It’s refreshing to see such a stylish look that’s so intelligently individual. i don’t think i’ve ever been to soho when it wasn’t raining. I think her big red Balenciaga just makes the whole thing work. But there’s also something about how her hair and the shirt echo each other that I can’t quite put in words. i want this ensemble- especially those boots- yes!!!!! Fashionably unkempt. I like it all and wonder. . .how much for this look? Each item looks like it could have a considerable price tag (so she’s in Soho & looks like a model), and for me, this alone dimishes the overall effect. Maybe I am wrong. Love the colours and the proportions! great, great, great. minus the aladdin-esque pants. unnecessary, it wasn’t that cold and they ruin the pretty linen white dress. The lovely Sheila Marquez. You snapped this model in Paris as well – running from a show in a hat and with the same bag. Long live Saint Laurent’s Russian peasant collection! I enjoyed the wide array of fashion statements that you have assembled here. love everything about it. The hair goes well with the outfit. whether she intended for it or not. I love the whole contrast lengths (short vest and long blouse; capri pants and high boots), texture and everything else about her. I also love her rock & roll hair! she’s hot. she looks great but as a whole can we please be done with the boho thing? this is one of my favorites..she is just too cool for words. I absolutely love this. Are those APC boots? They work so well with the slouchy bottoms. is there someone who could possible tell me who’s this bag? it is soooooooooooooo cool. It’s great how she intelligently mixes and matches, combinations that I wouldn’t have thought of. She pulls it off perfectly. What a surprising and pleasant mix of leathers. that’s an interesting look. i’m not sure that its flattering…but its nice in a way. agree about the vest. its reigns it in, but i’m sure she has a figure under there somewhere, but its a mystery. that bag is the coolest ever. is it time to pull out the balenciaga out already? wowza. when are you having a show so we can purchase your prints? Wow – she looks fantastic! I love, love, love that shirt – the detail on the sleeve is beautiful. is there someone who could possible tell me who’s this bag? The bag is a Balenciaga Weekender. I’m told the color is probably Rouge Theater from a past season. But Balenciaga always includes a nice red in the collection, so you could probably find something similar that’s current. like a younger and prettier patti smith. lovely. I love that vest. It’s so perfect over the flowing blouse. Sart, how do you get a shot like this with no other people in it? It looks like a movie set. I am not thaaaaaaaat in this one, but the boots are very cool. Soho is Soho – after, in or before the rain – in a beauty called Manhattan and this young lady is at one with the place, perfect. I love everything about this. She even manages to make the overly-ubiquitous Motorcycle bag look cool. Totally independent of this woman’s style, which is quite interesting proportionally, this photograph is amazing. The color criss-crosses in redgrey gradients; perfect focus. Nicely captured, Scott. what a gorgeous red bag. My mother had a similar one when she was young, which she has recently passed on to me. I love it. Oh, that vest works beautifully in her outfit. She already looks stunning, but I feel that along with the vest, the boots and bag might be overkill with similar textures. Fantastic, though. usually hate bags this size, but this looks an ad for that bag – and it actually makes me like it! she looks like a poet on her way to a reading. that fish necklace is fantastic. Am I the only person who is just completely bored by the whole “it bag” thing? Apparently, yes. A perfect example of one of the best street shows in the world! I love NYC in the Spring! This photograph is breathtaking. When I look at it, I almost feel like I am in a dream. It makes the person looking at it feel like they themselves are standing in SoHo after the rain, transporting them to a place more misty and fabulous and mysterious than wherever they are at that moment of viewing. And that is what true art does to those who engage it. love the way the colors of the buildings in the background echo the colors the girl is wearing. I love the vest and think that it goes really well with the outfit. Judging by your style I think you would definitely like this international fashion site that I always shop on called http://www.irepresentfashion.com. It has unique stuff like the things your wearing from designers all over the world. By the way, I love the boots to! sheila probably got the bag for free from nicolas. she is one of the latest muses for nicolas and marie-amelie. she did the last show and also does fittings, etc. she has quite a past if you google her… a great future ahead of her! I clicked on this photo to enlarge it and was blown away – the pose, lighting, background etc are straight off the pages of a glossy fashion bible. Beautifully captured Sart. What do people carry in such large bags ? Really ? My bag is huge because I have two small children and a disabled sibling I travel with…..